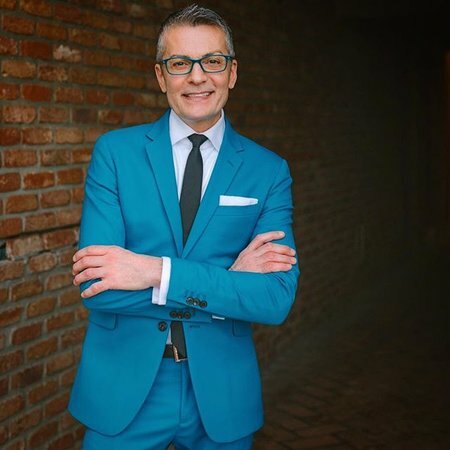 Is Randy Fenoli Gay ? The American fashion designer as well as a TV presenter, Randy Fenoli is best known for making Wedding Dresses on his TV show, Randy's Wedding Rescue. He is currently starring in Say Yes to the Dress since 2007. Fenoli is also known as the most trusted source in the Bridal industry. He also launched two bridal industry collections called Randy Fenoli for Dressy Creations and the Diamond Collection. He has won Design Excellence in the Bridal Industry awards and crowned with Miss Gay America in 1990. Randy Fenoli was born on 30th January 1964, in Mount Vernon, Illinois to American parents, Jeanette Fenoli. He belongs to white-American ethnicity and holds an American nationality. Fenoli is the youngest of seven children. He was passionate towards fashion, since his childhood days, and get involved in it when he was just nine years old. He went to the Fashion Institute of Technology and graduated in 1993. Before rose to stardom Randy Fenoli, 54, worked as a female impersonator, Brandi Alexander, he did his own hair makeup, designing, and sewing his own dresses. Fenoli first collection of the halter top helped him to establish as a young designer. Then he left to New York to sell real estate in New Orleans and pressure of bringing new line each season burned him out. Randy Fenoli has been involved in fashion designing since 1992. He launched two bridal industry collections: Randy Fenoli for the Diamond Collection and Randy Fenoli for Dressy Creations. Between 2007 and 2012, Fenoli severed as Fashion Director at the New York’s Kleinfeld Bridal Salon where he used to consult with nearly 15,000 brides a year. He was also offered a job at the Vivian Diamond Company. Fenoli is one of the well-respected members of the bridal industry. He speaks at several major bridal industry events across the globe. Fenoli also served as a fashion commentator for The Associated Press on the red carpet of 2010 Academy Awards. Moreover, Fenoli made his television debut through the 2007 American reality television series, Say Yes to the Dress, which follows events at the Kleinfeld Bridal in Manhattan. He also co-hosted the Toronto’s number one rated talk show, The Marilyn Denis Show. Fenoli then appeared as a guest on many TV shows, including, The Today Show, Good Morning America, Rachel Ray, The View, Extra, The Martha Stewart Show, and many others. Besides this, Fenoli is a writer and contributor, and many of his articles are featured in many publications which include, People, Parade. He also launched bridal magazines including, Inside Weddings, Martha Stewart Weddings, Southern Weddings, New Jersey Bride and Florida Bride magazines, and many others. On 1st November 2011, Randy published his first book titled, It’s All About the Dress, the bride’s ultimate guide for shopping for a wedding gown. He also contributor to other many websites and blogs including theknot.com and TLC.com. Randy Fenoli is one of the popular fashion designer and television presenter, who has an estimated net worth of $4 million. As of now, Fenoli made his appearances in the number of television and earned a decent amount of money. As per some online sources, the American fashion designer salary is between $55k and $75k, and Fenoli is one of the famous designers, so might be his salary is more than this. Randy Fenoli is possibly single at the moment. He is openly gay as he won the title of Miss Gay America in 1990. He is quite secretive towards his personal life and prefers less interaction with the media. However, there was a rumor he married to American actress and singer, Liza Minnelli. I was married to Liza Minnelli online for seven years. I thought I should send anniversary flowers. Later, he denied the facts, and there has not been any evidence to prove this.